Frame: Synapse Disc Women's Asymmetric, BallisTec Carbon, Di2 ready, SAVE, BB30a, flat mount, 12mm thru axle. 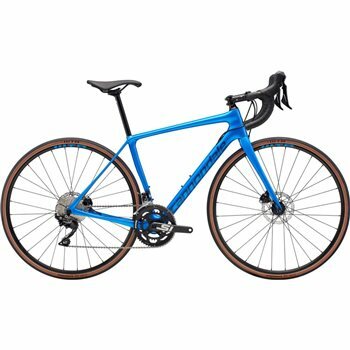 Fork: Synapse Disc Women's Asymmetric, BallisTec Carbon, SAVE, integrated crown race, 12x100mm thru-axle, size-specific design 44-48: 1 1/8" steerer/60mm rake, 51-54: 1-1/8" - 1-1/4" tapered steerer/55mm rake. Rims: WTB ST i19 TCS, 28h, tubeless ready. Tires: WTB Exposure TCS, 700 x 30c. Shifters: Shimano 105 7025, 2x11. Brake Levers: Shimano 105 7025 hydro disc. Saddle: Fabric Scoop Women's Sport, steel rails. Seatpost: Cannondale C3, 6061 Alloy, 25.4 x 350mm.